So many times I get glockenspiels with a note bar missing and enquiries about the cost of replacement. So many times people are shocked at how expensive glock notes are to be replaced. My Dad used to drive my Mum up the wall when, for instance, he moaned about the price of restaurants when visiting me in London. My Mum’s philosophy is, that if you want to go to London you will have to eat, so it will cost what it costs. This is the same philosophy that is needed for the missing note bar on that beautiful old case glock. Furthermore Murphy’s Law dictates that the missing note will invariably be the one that is needed. My blog posts continually demonstrate that jobs are not straight forward when done properly. If you want to replace your glockenspiel note with a shiny bit of metal with a hole drilled in it, I am not your man, there are plenty of pretenders who can do that. But if you want to fill the space in your glockenspiel with a note, then you need an instrument maker to make one and making things takes time. So what is the difference between “the shiny bit of metal with a hole in it” and a glockenspiel note? Well first of all there is material selection – that bit of steel I used is very good quality high tensile steel which is over 70 years old. You just can’t buy this steel anymore, and this is what gives the note bar sustain. It was then cut to size and a hole drilled into it which is the easy bit. After pre-finishing the bar, I tuned it paying special attention to matching the timbre so that it blended with the adjacent notes. With the note acoustically close to where I want it, the metal is polished and plated. In this case I Nickel plated it so it will age to look like the rest of the instrument, then it got its final tune and was put on the instrument. Because money is always an issue, I do try very hard to keep costs down. In fact I invest all the time in tools and jigs if they will both increase efficiency and elevate standards. However sometimes I just have to draw the line. 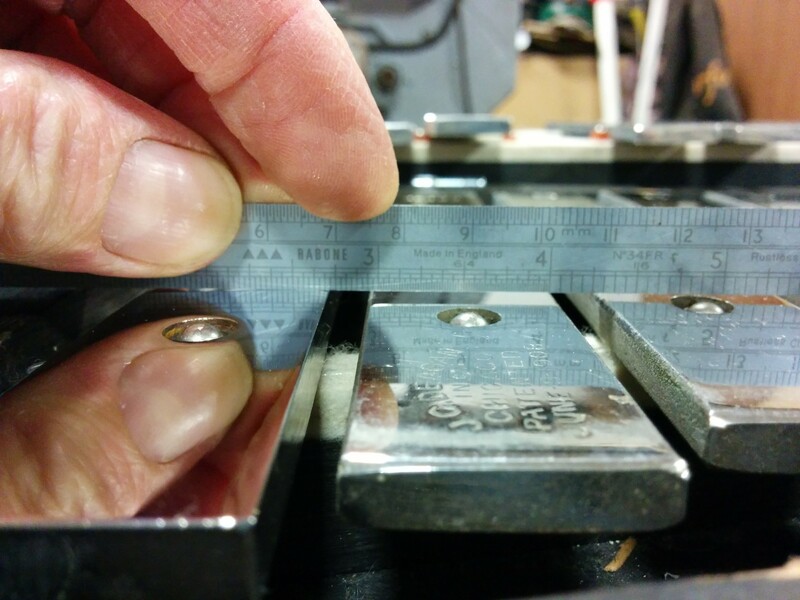 My milling machine needs replacing, so thicknessing the metal had to be done by hand. I took about 1mm off, but the finished bar was still higher than the others, but it would have taken ages to get it exact. Compromises aside, there is an argument for keeping repairs and replacements visible. I never worry too much about getting things absolutely identical. For instance, the pitch marking is different, but who cares? For me the main thing is the musicality, making it sound like the original. 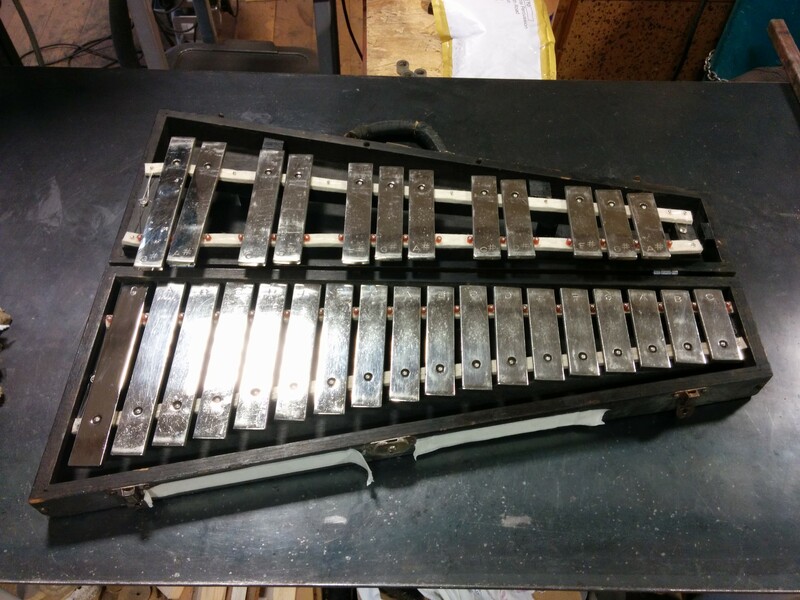 Hello, I have old, and very heavy glockenspiel note bars that I am trying to find some kind of history about. I am in New York and have owned then for about 30 years. Would you be able to guide me on how to start? I have pictures.